OJ&B Hosts Tweetheart Tweet Up At The Mandarin Oriental MO Bar Val Day Morning! During the Spring/Summer 2012 Mercedes-Benz Fashion Week season I teamed up with The Mandarin Oriental to do a tweet up in their Bing Lounge! This season I am thrilled that they asked me to host another tweet up for all my guys and gals on Valentine's Day! OJ&B my Valentine at the Tweetheart Tweet up tomorrow from 11am to 12 noon at the Bing Lounge located in the Mandarin's MO Bar on the 35th floor! 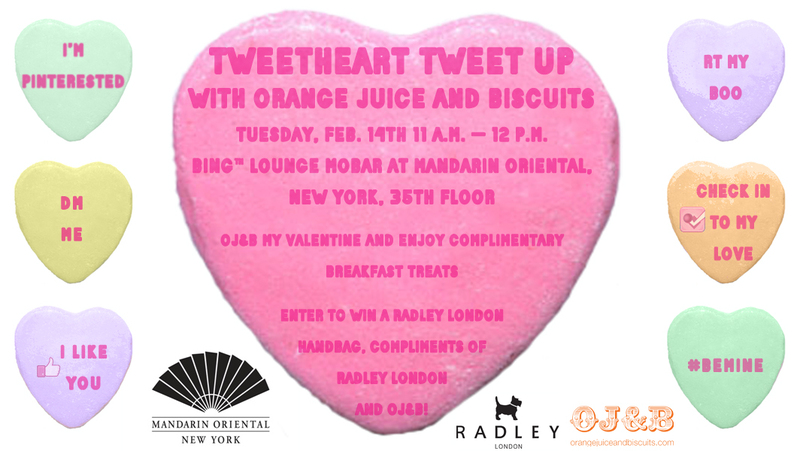 Come and enjoy complimentary breakfast treats and enter to win a Radley London Handbag compliments of Radley London and OJ&B!! Make sure to use the official hashtag for the event “#MOJBbreakfast”. You may or may not have a Boo this Val Day but no matter your relationship status on Facebook, come and be fabulous with OJ&B and The Mandarin (or the Mandy as I like to call it). Who knows, you may come in single and leave with a hot date... or at least a fierce Radley London Bag! For more information and to see the official press release click here.